This one page WordPress theme is powerful, bold, versatile, beautiful and well-structured with modern layout that perfectly fits all types of websites ranging from small business to large corporate company, online store, blog and portfolio. Array of advanced functionality will make potent website that will be ready to face tough competition without ever bloating. Amazing features and numerous design options aid you in designing a unique website that will make the most of your online presence and take your business to great height of success. This one page WordPress theme offers multiple choices for blog template, website layout, header and footer styles and menu styles so that you can decide the look of your website and give it personalized touch. 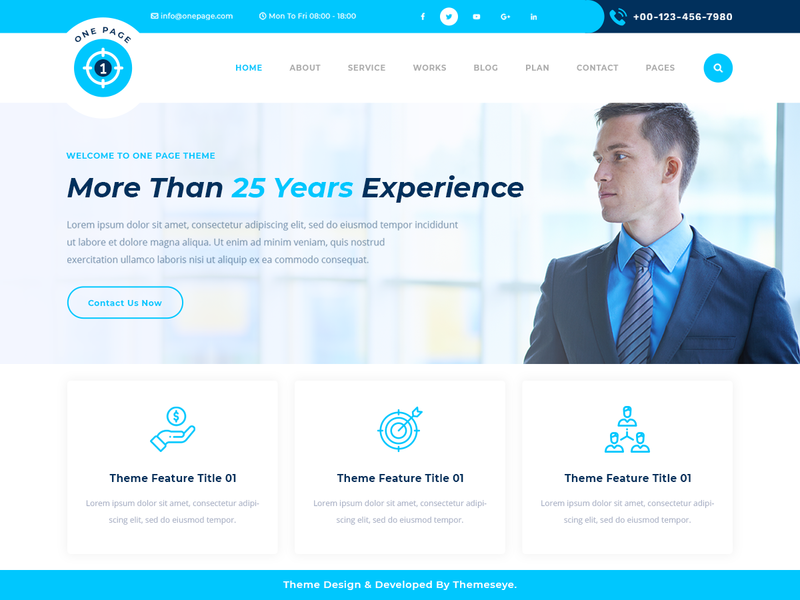 We offer premium membership along with this premium theme wherein you get complete access to our customer support and regular theme updates for one year. To make your website easily accessible from all types of devices and browsers, this one page WordPress theme is made responsive and cross-browser compatible. It is totally customizable with the freedom to change its colour, font, images, background and logo. The slider settings of this theme can be configured to make it more impressive with many different effects. This one page theme has parallax scrolling that looks stunning on any device. It has many sections predesigned like gallery, testimonial, services offered, about us, contact form, Google map, team members etc. to fulfil varying website needs of different businesses under one roof.